We do not only want to keep manufacture free of harmful substances. For our latest "Green Label" series, we are now also using recycled materials. This new bags collection is therefore made of recycled material and of material that is free of harmful substances. The popular Lässig Shopper is great for shopping, a trip or as a sports bag. Let’s make the world greener! Following the motto: “A bag for you, a tree for us“, Lässig GmbH cooperates with the Society of Protection of German Forests (SDW) in a first project of eco-sponsoring. Charity bags made of recycled polyester have been produced especially for this endeavour. 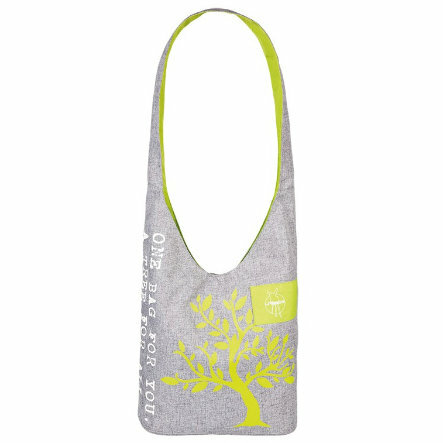 We will plant a tree for every sold charity bag. With this project, we want to honour ‘Mother Earth’ - we all need the forest for clean air. Everyone can do their bit. Therefore, we would like to ask you to support us and our project. We want to protect nature with this project - without healthy forests, we will run out of clean air sooner or later. Join in and help with your ecological contribution. Nature is counting on you. As do we. We are looking forward to your support and THANK YOU in advance. This bag makes trees grow - and many trees make a forest.